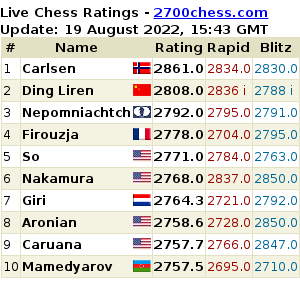 'It's just for your good mood', they explained to the chess players, who were looking slightly confused. 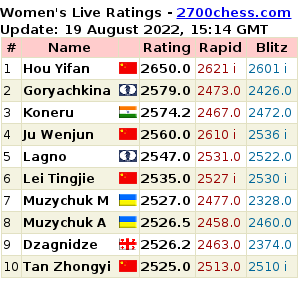 Ekaterina Kovalevskaya, 2004 World Women's Vice Champion, is followed by Anna Ushenina, 2012 World Women's Champion. Alina Kashlinskaya with her mother. The Georgian delegation is behind them. Inna Gaponenko (in front), Salome Melia, the chief arbiter Zsuzsa Veroci, and the prominent Nona Gaprindashvili. The first question Nona asked me was: 'Do you know the results of yesterday's football matches?'. I was ashamed, as I didn't know it. Kirsan Ilyumzhnov, Nikita Kim, Ilya Merenzon. The one holding FIDE President's jacket is Berik Balgabaev. RCF President Andrey Filatov would often glance at our camera. Ilyumzhinov feels visibly comfortable surrounded by officials. Two beauties among the Russian delegation: Olga Girya, Alina Kashlinskaya. Igor Levitin reading Putin's greetings. Happily, the speeches by the officials were brief enough. The tournament #1, Humpy Koneru, has pulled the white flower out of the box during the drawing of lots. As demonstrated by the chief arbiter Zsuzsa Veroci, the black flower had been really put into the other box. Interesting things started to happen near the end of the opening ceremony, when a famous musical band A'Cappella ExpreSSS appeared on the stage. Its repertoire was consisting mainly of jazz, but the second composition was Tbiliso, one of the most famous Georgian songs. While the Georgian part of the audience was astonished, the officials were looking at each other and finally started to smile as if by chain reaction. Thus, let me state that March 16th, 2015, is the day when the relations between Russia and Georgia have become considerably warmer. It happened in the Russian city with the Georgian name. The instrumental jazz by Vadim Eilenkrig and his jazz band was also great. The fourchette began without the players themselves, as they had to go to the technical meeting. Some of them would join it later. The second part of the dinner, already without candles but with tables and the ongoing musical performance. Pia Cramling taking a snap of Monika Socko. Who knows how long the knock out championship will be for each participant? The photo will keep the memories anyway.